ARDOR is the culmination of half a century of creativity by California poet Janine Canan, whose roots reach into the traditions of the world. This is an inspired poetry of passionate engagement, contemplation, spiritual ecstasy, and prophetic wisdom, abounding in natural majesty, intimate lyricism, and a searing vision of human life. Janine’s poems overflow with devotion to the word, breath-taking imagery, courageous truth-telling, piercing grief for our world, deep love for Nature and the Feminine, and luminous all-encompassing mysticism. How Janine combines these is the mystery of her unique gift. Janine Canan's ARDOR: poems of life reminds me that, ultimately, poetry is not words. To read the poems in ARDOR is not to end up focusing on the words so much as what's traveling in-between the words: skeins of light, rapture, desire and other stuff one can't articulate. There's an energy within the book that, in its best moments, even hearken musica universalis (I felt such a moment at the end of Section 1, "Meetings with God"). To have the ability to generate that effect in a reader testifies to ARDOR's great accomplishment, especially because it is religious (from "Dictionary" is a line I find absolutely divine: "every word is holy"). I think it's difficult to write religious poems that move the non-practitioner. Laura Amazzone, one of the back cover blurbers of the book and author of Goddess Durga & Sared Female Power, describes the poems in ARDOR as "profound offerings of fierce Mother wisdom." I am not a devotee, nor even particularly knowledgeable, of the Mother goddess tradition, including Hinduism/Shaktism (which I mention as the book is published in India and the author has written books on goddesses). But my ignorance was not a hindrance in understanding why another blurber, Barbara Brooker, author of The Viagra Diaries, says of the poems: "They powerfully show that women are the sun, flowers, moon and muse." Horrible acts of ignorance happen all the time. may I stand still and utter no harmful word. into the casket I set on fire and burn to a cinder. Even as his bullet enters my heart, too. sour grapes, scorn even more. What makes these so-called poems? nothing to say or praise. I’m ecstatic—have written four poems listening to Bach, and now will do the dishes. Then shower and go over to Helen’s to hear her tape on self-love and the levels of love. At five I’ll do my shopping at the Co-op, buy two new tires and get my car washed, then come home and get ready—uh oh, the phone is ringing and it’s Carol asking about the party and I say, Come over at ten, we’ll have a drink, then go on over to Steve’s. She says, That’s perfect, and I say, I’m writing a poem and if I hurry and hang up I can get you in the poem too. I’m beginning to realize that everything really does belong in the poem and this poem could go on forever. I have been in this life. First, I was given a human body. Ardor: Poems of Life by Janine Canan is a hefty and heavy set of poems and essays about life, the destruction of the earth, and the destruction of the planet wrought by men. Broken down into eight sections from communing with God, homage to the strength of women, the sadness that comes from a destroyed planet, and a general awaking to the wonders of the world and moving into a full experience of life. The second section, “Tears for the World,” and section three, “Indestructible Woman,” offer a no-holds-barred perspective on destruction caused by humanity or the oppression of women by men in societies across the world even today. In many ways, some of these poems mirror the most radical forms of Ecofeminism, in which women are the closest to the Earth and should resume their position as leaders and teach men to cooperate with nature rather than dominate it — though some even espoused the dominion of women over men. There is even one poem dedicated to the late Mary Daly, one of the main philosophical thinkers of the movement. the woman stepping out of the river. There are lines and images and moments here that will make some angry, while others will nod their heads at the truth of it. There is the destruction of nuclear bombs created by men, there are the women who are subservient to men, and there is even more. Man has his boot on every inch of the world. His conquest is nearly complete. While these are hymns and elegies to the earth and women, there are other poems that are less “abrasive” than others, but still offer a sense of what the reader is trying to convey about the harm that has come to the planet and to women. The less declarative poems are the most powerful, offering imagery that recalls in the mind the beauty of nature and the wonders that are yet unexplored. These poems call on readers to regain their childlike wonder and stand in awe of the world around them, not to tear it asunder in the thirst for fulfillment. and manifesting a new one. And food, the kind that tastes good. is one of the million gods I worship. I rooted in the fragrant earth. 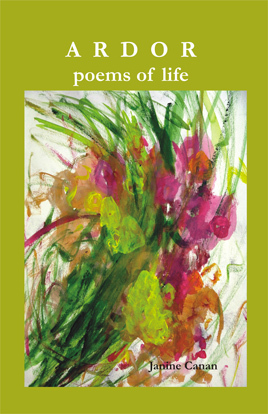 Ardor: Poems of Life by Janine Canan mixes philosophy, history, poetic imagery, and declarative statements to create a collection of poems and essays that examine the state of the modern world without sugar coating anything. There are moments that will get under readers’ skins and maybe cause them to stop reading in disagreement, but Canan’s poems should not be ignored given the degradation that continues to happen from the oil spills in the Gulf of Mexico to the oppression of women that continues today. These are issues that cannot be ignored if the planet and humanity are to survive beyond just a few generations. This collection features earlier submitted works of poetry from other books and journals. I found Ardor very spirited. Ardor contains free verse, koans, commentary on modern life, verses on women as goddesses, a few translations, prayers to deities, and, quirkily, some poems that the author is self-aware about writing poetry. Some poems were very simple (only a few lines at best). It appears as if the poems are meant to be read, not spoken, as it would sound quite awkward listening to its uneven meter. Interestingly enough, the poems about poetry made me laugh. One in particular, “Imposters,” slams other “poets” who are nothing but mechanics and vampires. At least Canan isn’t “strangling language” to get her message across and does have something to say or praise. Canan has been writing poetry for a very long time, evident by her writing credits. Readers who are into Eastern mysticism, Goddess worship, and female empowerment will enjoy this book.